Merhaba değerli dinleyenler, yine yeni bir "Enlem ve Boylam"da, 107. 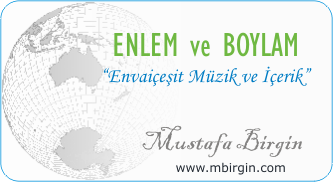 "Enlem ve Boylam"da, "Envaiçeşit Müzik ve İçerik"le, Temmuz 2017 itibariyle huzurlarınızdayız. The safety officials made a routine inspection of the power plant. He deliberately misled us about the scale of the problem. He was so excited about the trip, it was inevitable that he would be disappointed. The burning of fossil fuels is having great implications on the environment. The tree trunk was hollow and insects lived inside it. It’s easy to mistake a hare for a rabbit. Bu sayfa, 07/31/2017 tarihinde yayınlanmış ve 1910 defa görüntülenmiştir.